Margaret R. Thrailkill (MS '38), of Spokane, WA, was recently named Honorary Board Member of the North Idaho College, Coeur d'Alene, Idaho Foundation after 30 years of membership and participation. Sterling D. Sessions (MBA '50), of Ogden, UT, recently co-authored the book, A History of Utah International, published by the University of Utah Press. Gustav Schachter (MBA '56, PhD '62), of Brookline, MA, a Professor Emeritus of Economics at Northeastern University for the past 40 years, has co-authored a book, Cultural Continuity in Advanced Economics, with Saul Engelbourg, a Professor Emeritus of History at Boston University. Stan West (MBA '56), of Lake Worth, FL, was reappointed to the Consumer Advisory Panel of the Palm Beach County Water Utilities Department for which he also chairs the Administrative Hearing Board. He was also certified by the Supreme Court of Florida as a County Court Mediator. In addition, The Florida Bar Association appointed him to its Grievance Mediation and Fee Arbitration Committee for the 15th Circuit (Palm Beach County). Norman J. Politziner (BS '64), of Monroe, NJ, is the President of NJP Associates, a company that specializes in estate planning and benefits packages for business owners and high net-worth individuals. William H. Turner (MBA '66), of Upper Montclair, NJ, was recently appointed to serve on the board of directors for Ameriprise Financial, formerly American Express Financial Advisors. He is the Dean of the College of Business at Stony Brook University, in Stony Brook, NY. Ed Konczal (MBA '68), of Piscataway, NJ, co-authored a book, Simple Stories for Leadership Insights, published in October 2005 by University Press of America. Thomas M. Super (MBA '70), of Eatontown, NJ, was recently appointed to the Corporate Advisory Board of Amedia, a provider of switched Ethernet ultraband solutions for the Triple Play Access Market. He is the Chief Technology Officer of NHC Communications, which designs and manufactures remotely controlled cross-connect devices commonly used by telecommunications carriers. Anthony C. La Russo (MBA '72), of Naples, FL, recently published his first book, Management: Ready Aim Fire. He has over 30 years of business experience, has served as Adjunct Professor, and has written numerous articles. Richard Berman (MBA '73), of New York, NY, has been named CEO of NexMed Inc., a developer of transdermal products based on its proprietary drug delivery technology. He has served on the Board of Directors of NexMed since 2002 and has over 35 years experience in venture capital, management, and merger and acquisitions. Robert G. Hill (BS '73), of Pittsburgh, PA, has been named the 2006 Renaissance Communicator of the Year by the Public Relations Society of America's Pittsburgh Chapter. This award honors practitioners for excellence in communications. He is currently the Vice Chancellor for Public Affairs at the University of Pittsburgh. Ernesto M. Ordonez (MS '73, PhD '76), of Pasig City, Philippines, was elected Vice President of the ASEAN Federation of Cement Manufacturers. He is currently the President of the Cement Manufacturers Association of the Philippines. Thomas G. Hudson (MBA '74), of Boulder, CO, was recently appointed to the Board of Directors of Incentra Solutions Inc. He was most recently Chairman and CEO of CNT, which was sold to McDATA in June of 2005. During his tenure, he grew the wide-area storage networking business revenue from $65M to $360M. Robert S. Loffredo (MBA '75), of Westwood, NJ, was recently appointed Financial Consultant at A.G. Edwards & Sons. Raymond W. Dusch (BS '76), of East Setauket, NY, has been appointed to the Board of Editors of LJN's Equipment Leasing Newsletter, published by Law Journal Newsletters, a division of American Lawyer Media. He has written numerous articles for the newsletter and other equipment leasing publications over the last 25 years, and recently completed his three-year tenure as a member of the Legal Committee of the Equipment Leasing Association of America. Gabriel Hawawini (PhD '77), of Fontainebleau, France, Dean of INSEAD and periodically a visiting professor at Stern, received France's highest award - La Légion d´honneur - this January in Paris. The award is an Order of Chivalry first established by Napoléon Bonaparte and is conferred by France's president upon French citizens and foreigners for outstanding achievements in military or civil life. Martyn R. Redgrave (MBA '78), of New Albany, OH, has been appointed to Chief Administrative Officer of the Limited Brands. Thomas McConnon (BS '79), of Commack, NY, has been elected to the Board of Directors of the Rotary Club of New York. 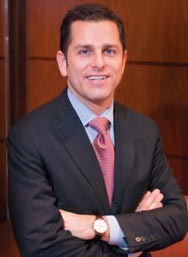 David A. Handler is Senior Managing Director at Bear Stearns. He joined the firm in 2000. As Founder and Co-head of Bear Stearns Global Communications Technology and Software Group, which has handled more than $25 billion in financing and advisory assignments, Handler works with clients in the United States, Europe, and Asia on mergers and acquisitions of communications technology companies. He is also a member of Bear Stearns’ President’s Advisory Council. Prior to joining Bear Stearns in 1995, Handler was employed by Jefferies & Company as Vice President. He was promoted to Managing Director in 1998, with responsibility for overseeing the firm’s Technology Group and New York Investment Banking office. For the past 12 years, Handler has been a member of the Board of Directors of Penn National Gaming, the nation’s third largest gaming company. In 1998, he became a member of the Board of Directors and of the Executive Committee of the New Group, a highly-regarded nonprofit organization that promotes the arts in New York City. He also administers the Grosevnor Foundation, a charitable trust he founded that supports numerous local and national nonprofit causes. A dual degree graduate of Stern, Handler speaks of an “incredible program that more than exceeded my needs.” He is an active alumnus, currently serving on the Undergraduate Dean’s Advisory Council, a non-overseeing affiliation that assists in shaping the College’s direction, and he encourages current students to take advantage of all that the School has to offer. “Stern has made so many radical changes for the better over the past 20 years, probably more than any other top business school over the same period of time,” he says. John W. Burns (MBA '82), of Sudbury, MA, was appointed by the Board of Directors of GlycoGenesys Inc., to the additional positions of Interim Chairman of the Board of Directors and Treasurer. He is currently the firm's Senior Vice President and CFO. Barbara Bacci Mirque (MBA '82), of Pearl River, NY, has been named Executive Vice President of the Association of National Advertisers (ANA). Antonio Rodriquez (MBA '82), of Malibu, CA, has been appointed Senior Vice President of North American Operations for Warner Brothers. In his new role, he will be responsible for US sales, finance, operations, sales planning, and the Canadian offices. He previously served as US Senior Vice President of Finance for Warner Brothers. Kenneth Brown (MBA '83), of Weston, CT, has joined ABCO Refrigeration Supply Corporation as CFO. Murray S. Kessler (MBA '83), of Bedford Corners, NY, has been named President and COO of UST and has been elected to the Board of Directors. Prior to this, he was President of UST's principal operating subsidiary, US Smokeless Tobacco Company (USSTC). In his new role, he will be responsible for UST's major operating subsidiaries, USSTC, and International Wines & Spirits. He also oversees UST's corporate communications, investor relations, and government functions. Robert Angell (MBA '84), of Sherborn, MA, was recently appointed Director of Small Business Practice for Accounting Management Solutions (AMS). He previously owned a consulting firm which provided interim executive and advisory services to executive teams and boards of directors. Eric Litzky (BS '84), of DeMarest, NJ, has been elected by the Board of Directors of American International Group (AIG) to service as Vice President of Corporate Governance. He has also been named Special Counsel and Secretary to the Board of Directors. Nancy Corporon (MBA '85), of Columbia, MD, was recently affiliated as a realtor with RE/MAX Exclusive in the Baltimore/Washington, DC, area. Matthew Flynn (MBA '85), of Hartsdale, NY, has been appointed CEO of Hanley Wood. He was previously Senior Vice President, CFO at PRIMEDIA. Jason Mannis Palmer (BS '85), of Huntington, NY, has been elected to the Board of Directors of the New York State Society of Certified Public Accountants, the oldest and largest state accounting association in the nation. He also serves as President of Palmer Computer Services Inc., in Huntington, NY. Christopher J. Policinski (MBA '85), of Shorewood, MN, has been named President and CEO of Land O'Lakes Inc.
David Gross (MBA '86), of Louisville, CO, has been named Chief Financial and Administrative Officer at RGL Forensics Accounting & Consultants. He previously served as RGL's Director, US Finance. Raj Mitra (MBA '86), of San Dimas, CA, was named Senior Director of Thales Navigation, a subsidiary of the Thales Group, a EUR 10 billion French electronics company. Mark R. Patterson (MBA '86), of Bronxville, NY, and his teammates obtained second place in the 24 Hours of Daytona race. His race car carries the NYU Stern logo, among others. Bernard Tubiana (BS '86), of New York, NY, has been promoted to Principal of Deloitte Consulting LLP. Carlos T. Blanco (MBA '87), of Caracas, Venezuela, has been named President of Centennial de Puerto Rico. Robert Matza (MBA '87), of Scarsdale, NY, has joined GoldenTree Asset Management as President. He will have responsibility for business management, administrations, operations, and finance, and will help determine the strategic direction and growth of the firm. He most recently served as President and COO of Neuberger Berman, as well as a member of the Management Committee at Lehman Brothers. David M. Saunders (MBA '87), of Stony Brook, NY, was recently appointed Group Director and Senior Vice President of Signature Bank's Melville, Long Island, office. He joins Signature Bank from Bank of America where he served as Senior Vice President of middle market lending. Marianne Sciolino (MBA '88), of New York, NY, has started an artist management firm, Sciolino Artist Management (SAM). Joel E. Kadis (MBA '89), of Newton, PA, was recently named Partner of Linear Retail Properties, a retail real estate acquisition and operating company. He joined the firm in 2004 as Senior Vice President of Leasing and Asset Management after spending five years as Regional Director of Asset Management for Wellsford Commercial Properties Trust, a Goldman Sachs-affiliated company. Richard A. Reich (MBA '89), of Arcadia, OK, was recently promoted to Senior Vice President of Corporate Finance at Banc First. Formerly, he was the Director of Risk Management at OGE Energy Corporation. In Hollywood, youth is a perennial obsession. But in December 2005, as Fast Company magazine was compiling its list of the 10 hottest minds in Hollywood, it included an entrepreneur with more than 40 years of experience under his belt. As Co-founder, Chairman, and Chief Executive Officer of Access Integrated Technologies Inc., Bud Mayo heads a pioneering company that is leading the way for the transition from film to digital in the movie industry. AccessIT provides proprietary software and services for movie producers, distributors, and exhibitors. 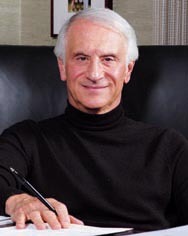 Mayo conceived the idea for AccessIT while serving as President and CEO of Clearview Cinemas LLC, which he founded in 1994 and sold to Cablevision in 1998. Mayo is a serial entrepreneur. He began his career with IBM as a computer salesman and later co-founded more than a dozen computer services companies. He was the Founder, Chairman, and CEO of Clearview Leasing Corporation, a lessor of computer peripherals and telecom equipment. Between 1994 and 2000, he built Clearview Cinemas from an eight-screen operation into a 300-screen chain, whose outlets included the Ziegfeld Theatre in New York City. He also served in various senior corporate finance positions on Wall Street. Jeff Haveson (MBA '90), of Monmouth Junction, NJ, has started a new financial planning firm, Matrix Financial Advisors LLC, based in Princeton, NJ. Patrizia E. Micucci (MBA '90), of Foggia, Italy, was recently featured in The Wall Street Journal's “Women to Watch” report as one of the top ten managers to watch in Europe. She is the Managing Director, Head of Investment Banking in Italy, for Lehman Brothers Holdings. Thor Bjorgolfsson (BS '91), of London, England, was featured in the Financial Times (London Edition) and was listed in Forbes as Iceland's first billionaire. A global entrepreneur, Bjorgolfsson is Chairman of Burdarasa, an Icelandic financial holding company, is a partner in an Icelandic investment company, and owns large stakes in a Russian beer company, Icelandic generic pharmaceutical company, the National Bank of Iceland - Landsbanki, and telecom companies in the Czech Republic and Bulgaria. Keith Kaplan (MBA '91), of Ramsey, NJ, was promoted to Vice President, Marketing and Product Development at Comtex News Network Inc., a provider of electronic real-time news and content. Previously, he held the position of Director of Product Development and was instrumental in the introduction of various new products and in the development of new corporate branding campaigns. Ronald D. Kazel (BS '91), of Arlington, VA, has been named a Managing Director of Annaly Mortgage Management Inc.
Patrick E. Phelan (MBA '92), of Elk Grove, CA, recently joined North Bay Bancorp as Executive Vice President and CFO. He will oversee financial matters of North Bay and its subsidiary bank, The Vintage Bank, and its Solano Bank division. His responsibilities include financial and regulatory reporting, financial analysis and planning, general ledger management, budgeting, capital management, asset/liability management, fixed assets, and accounts payable. Lawrence Handen (MBA '93), of Potomac, MD, has recently joined Insight Venture Partners, a venture capital firm exclusively focused on the global software and Internet services industries, as Managing Director. He will be responsible for deal flow execution and management in Insight's newly launched Insight Venture Partners V. Previously, he was a Managing Director at VantagePoint Venture Partners, where he managed investments in the software, Internet, and media sectors. Claudia Harris (MBA '93), of St. Louis, MO, and husband, Noel, welcomed daughter Isabella Keyvan, on August 26, 2005. Steffin Gorig (MBA '94), of Munich, Germany, was named Managing Director of Mondi Packaging, a release liner production company. Philip Lam (MBA '94), of Closter, NJ, recently accepted a job to head up the US operations for Yappa Corporation, a 3D Web technology and creative services company headquartered in Japan. Steven Berns (MBA '95), of Short Hills, NJ, was recently promoted to President and CFO and appointed a member of the Board of Directors of MDC Partners. In this new role, he will work more closely with MDC Partners' operating businesses, and will continue to be responsible for overseeing MDC Partners' financial management and corporate development teams. Michael K. Clark (MBA '95), of New York, NY, has co-founded Stinson Partners, a marketing consultancy/agency that specializes in interactive and direct marketing. Jason O. Hirschhorn (BS '95), of New York, NY, was recently named Global Chief Digital Officer at MTV Networks. He will be responsible for coordinating MTV's digital media efforts. Travelers take the American Express card with them all over the globe. The company behind the card also has a way of making sure its executives see the world. In his 27 years with American Express, Massimo Quarra has worked in Latin America, Asia, and Europe, where the Italian executive serves as President of the company’s European offices. Quarra joined the company in July of 1979, after receiving an MBA in international finance from NYU Stern, and spent the early portion of his career working in a variety of finance positions in both Latin America and Asia. 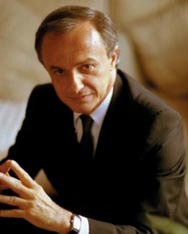 He returned home to Italy in 1987 to serve as Chief Financial Officer of American Express Italy. Throughout this tenure, he continued to broaden his professional repertoire to include systems, operations, marketing, sales, customer service, and relationship management. Quarra was appointed Managing Director of American Express Italy in 1993, Regional President of Southern Europe in August 2000, and President of Europe in July 2004. Robert H. Von Furth (MBA '95), of Northampton, MA, recently joined Ryan Becks & Co., an investment firm, as Managing Director. He will be responsible for originating, structuring, and executing transactions for consumer products and services companies and will oversee the expansion of the firm into the restaurant, grocery, and food sectors. Prior to joining the firm, he was a Managing Director of Deloitte & Touche Corporate Finance LLC. Pialy Aditya (BS '96), of New York, NY, recently received her MBA from Harvard Business School. Natalie A. Birrell (MBA '96), of Westfield, NJ, has recently joined Arden Asset Management Inc., a leading fund of hedge funds manager, as Managing Director with the responsibility for working to enhance the firm's technology, infrastructure, risk management, strategic planning, and new product platform, portfolio operations, and investment processes. Previously, she was a Managing Director and COO of Deutsche Bank's Absolute Return Strategies Group. Kevin Ma (MBA '96), of Columbus, OH, and his wife, Margie, welcomed a son, Stephen Stanley Ma, on May 17, 2005. Kevin was also promoted to Director of Leveraged Loans for the Office of Investments Group at Nationwide Insurance. John A. MacPhee (MBA '96), of Ridgewood, NJ, was promoted to President of the Branded Products Division at Par Pharmaceuticals Companies Inc., and elected a corporate officer by Par's board of directors. In his new position, he will continue to develop marketing and sales strategy and establish first priorities for the branded business, including identifying new markets and new products. Yvonne K. Briggs (MBA '97), of Brooklyn, NY, has recently been appointed to Vice President of Business Development at IRIS International, a manufacturer and marketer of automated IVD urinalysis systems and medical devices used in hospitals and laboratories worldwide. Her role includes identifying, evaluating, and executing potential strategic initiatives in the area of new technologies and product opportunities. Jonathan Eng (BS '97), of New York, NY, recently joined IBM Business Consulting Services in the Financial Markets Practice. In addition, he married Alice Teng at the Four Seasons Maui on May 27, 2005. John T. Matwey (MBA '97), of New York, NY, was recently appointed as Director of Risk Management and Portfolio Services at Tremont Capital Management Inc. He will be responsible for managing several long-term initiatives for the firm's investment management group, including enhanced development and implementation of Tremont's risk analytics platform. He joins the firm from RiskMetrics Group Inc., where he had been a director in the Alternative Business Division. Robert Reitz (MBA '97), of Orem, UT, has been named CFO of Whole Living, a manufacturer and distributor of all-natural whole foods. He has direct sales experience in Singapore, Hong Kong, Malaysia, and other international markets. He also spearheaded a successful entry of a US-based company into the Japan market. 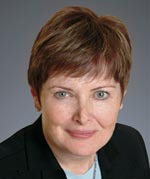 Ann N. Reese is Co-director at the Center for Adoption Policy (CAP), which she co-founded in 2001. CAP’s mission is to provide research, analysis, advice, and education to practitioners and the public about current legislation and practices governing domestic and inter-country adoption. Prior to creating CAP, Reese spent more than 25 years in finance. After graduating from the University of Pennsylvania in 1974, Reese joined the Bankers Trust training program as one of the few women preparing for a career in commercial banking. At that time, the only commercial banking positions available were in the Middle East, where women weren’t allowed to travel. Reese asked to be placed in the foreign exchange trading program, and landed on the foreign exchange desk. This experience led to a job offer from her client, Union Carbide. She later worked as the Treasurer of Mobil Europe and as the Executive Vice President and Chief Financial Officer of ITT Corporation. Now, Reese serves on the Board of Directors of Merrill Lynch & Company, CBS, Jones Apparel Group, Sears Holdings, and Xerox. In June of 2000, Reese and her husband, Stanley, expanded their family of three sons, (now 15, 19, and 22) by adopting two Romanian toddlers. Their son and daughter were developmentally delayed as a result of their time spent in institutions, and they needed speech and physical therapy. By the end of 2000, Reese had left her job to devote herself to her children's rehabilitation. Jed Fishback (MBA '98), of South Orange, NJ, and wife, Breena, welcomed their son, Jordan David, on September 29, 2004. Frank F. Lin (MBA '98), of Las Vegas, NV, and Desiree Marie Acosta (MBA '99), of Las Vegas, NV, were married on September 3, 2004. Sharon Simon Mahan (MBA '98), of Anaheim, CA, and husband, George, welcomed a son, Nathan Thomas, on February 28, 2005. Michael B. Munter (MBA '98), of Scarsdale, NY, has recently been promoted to Vice President of Operations for CareOne LLC, New Jersey's largest private owner and operator of long-term care and assisted living facilities. Lori M. Rutt (MBA '98), of Edgewater, NJ, and Alvaro L. Serrano were married in New York City on August 19, 2005. Daniel M. Cohen (MBA '99), of New York, NY, recently returned to the private sector after a three-year term in the Bloomberg administration, working at the city's economic development corporation. He now works for ING, financing development projects throughout North America. Lisa C. Markowitz (BS '99), of Allentown, PA, and husband, Dr. Moshe Markowitz, announced the birth of their daughter, Talia Esther, on June 21, 2005. Stacey Widlitz (MBA '99), of New York, NY, was appointed Managing Director for Pali Research. She will serve as a retail analyst covering specialty retail equities. Prior to this, she was a retail analyst at Fulcrum Global Partners. Kjerstin E. Barley (MBA '00), of San Carlos, CA, was recently appointed Senior Vice President at Origination, where she will be responsible for developing client relationships within the technology sector. She has more than 12 years of experience in technology and finance, most recently serving as Investment Banking Vice President for Bear Stearns. Yuri Brodsky (MBA '00) and Tammi Stegeman Brodsky (MBA '00), of New York, NY, welcomed their first daughter, Elizabeth Kathryn, on March 23, 2005. Siranoush Dervogormiyaciyan (BS '00), of Cliffside Park, NJ, recently received her MBA from London Business School. She moved back to New Jersey in fall 2005 and has taken a position with Booz Allen Hamilton. Stephane Kirkland (MBA '00), of Paris, France, has been appointed to the Board of Directors of SPE, the second largest Belgian electricity and gas company. William F. Sawyer (MBA '00), of Brooklyn, NY, recently joined Leerink Swann, an investment banking firm that provides healthcare equity research for institutional and high-net-worth clients, as Director of Specialty Pharmaceuticals. He will focus his research efforts on generic manufacturers. Previously he worked at Merrill Lynch on an Institutional Investor-ranked specialty pharmaceutical research team. Garvis Toler (MBA '00), of Rockville, MD, recently joined the Center for Financial Research & Analysis as Director of Sales and Marketing. In addition, he and his wife, Samantha Cherney Toler (MBA '00), welcomed their daughter, Grace Louise, on May 5, 2005. Danny Bao (MBA '01), of Shanghai, China, and Josh Kurtzig (MBA '04), of Beaverton, OR, have launched a new educational venture in Shanghai. The company, China Business Institute, aims to provide English-based business training to Chinese junior- and mid-management professionals. Marcus Hadden (MBA '01), of South Orange, NJ, and wife, Tasia, announced the birth of their son, Maximilian John, on March 30, 2005. Shahid Khan (MBA '01), of Princeton Junction, NJ, has joined Interactive Broadband Consulting Group LLC, a consulting firm advising top management in the broadband-related sectors of cable, mobile, technology, and digital media, as Partner. He will be responsible for leading major client engagements and for the firm's thought leadership and public relations activities. Andrew Pancer (MBA '01), of Tenafly, NJ, has been named COO of About.com, a content website which is a part of The New York Times Company. Gregory Wilmore (MBA '01), of New York, NY, was married to Barbara, on July 30, 2005, in Lake Placid, NY. Sandra Delmonte (BS '02), of Forest Hills, NY, and Raphael Frydman (BS '02), of Forest Hills, NY, were married on May 7, 2005. Olivier Neant (MBA '02), of Paris, France, and his wife, Miki, are pleased to announce the birth of their first child, Julia Ayumi, on April 13, 2005. Lukas Neckermann (MBA '02), of Munich, Germany, was recently quoted in Handelsblatt, a German newspaper, in an article entitled “Is an MBA from US Business Schools Still Worth It?” While giving credit to the development of European programs, he stated that US MBAs are still the “be-all and end-all of MBAs.” He is the Regional Leader for the NYU Stern Alumni in Germany Regional Group. Ashwin Ramji (MBA '03), of Arcadia, CA, has accepted a position as Senior Strategy Analyst at Provision Ministry Group, a nonprofit company located in Irvine, CA. Poupak Sepehri (MBA '03), of Boston, MA, has accepted a position as Global Communication Manager for GE Industrial Sensing. Breyt L. Coakley (MBA '04), of New Hartford, NY, and wife, Jane, announced the birth of their daughter, Olivia Jane, on December 1, 2005. Petter Nore (MBA '04), of Oslo, Norway, has been named General Secretary of the International Gas Union, effective October 2007. The announcement was made in Beijing on October 19, with 81 delegates from member countries and associate members from most of the world's oil and gas companies present. He is currently the head of Hydro's office in Moscow. Peter Williams (MBA '04), of Commack, NY, has been named Global Head of Hedge Fund Technology for UBS. Do you have a new job or promotion? An award, honor, or achievement to share? How about a marriage, new baby, or adoption? Let other alumni know about the things happening in your life. 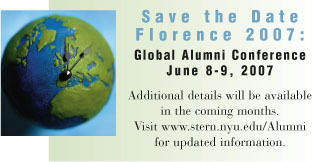 Send us your news and photos online through Class Notes in SWAP - the Stern Worldwide Alumni Platform - at www.stern.nyu.edu/Alumni, and we will publish it in an upcoming issue of STERNbusiness.